Huge, purple flash, labradorite teardrop and sterling silver pendant necklace. This huge, silky smooth, glossy, silvery gray, labradorite teardrop flashes with rare and gorgeous purple, lavender, pink, golden peach, and gold hues when it reflects light from one side. The front of the gem is rounded, and the back is flat. Like all the labradorite jewelry in my Etsy shop, this is a natural and untreated gemstone. The labradorite teardrop measures an impressive 50mm x 25mm x 8mm (2" x 1" x 5/16"), and it is suspended from a heavyweight sterling silver bail with a graceful pattern of twining leaves. The pendant dangles 56mm (2 1/4") from a substantial sterling silver chain that fastens securely with a large sterling silver lobster claw clasp. The necklace is shown with a 17" chain in the photographs. The pendant is removable, so you can also wear this luxurious chain with other pendants that have large enough bails or loops. 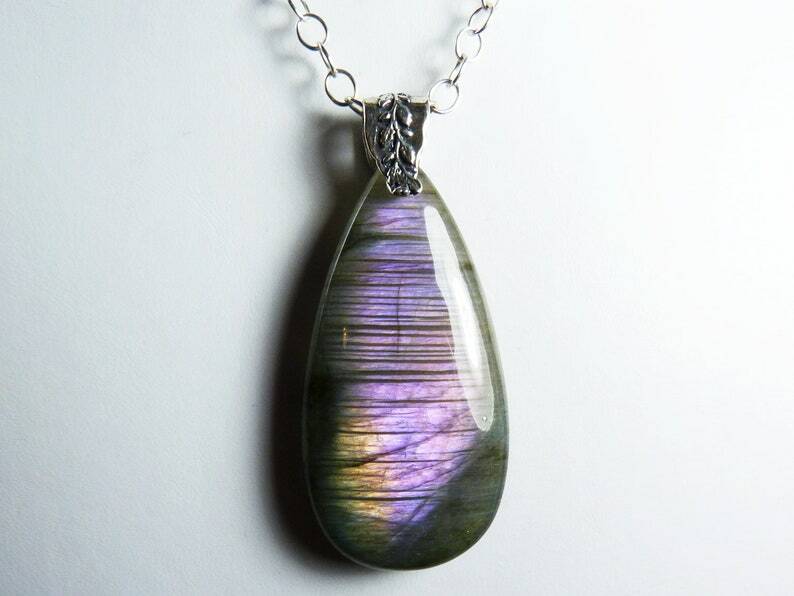 This dramatic labradorite pendant necklace flashes and glows with rare and beautiful colors as it catches the light!